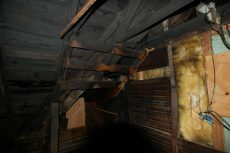 The fire started in the attic from unknown origin. It quickly spread to the rest of the building engulfing the roof of this home and the adjoining home. The fire spread down, causing significant smoke, fire and water damage to the all levels of the home. It devastated the roof of the home, burning it to char and cinder. Thankfully the students were able to sound the alarm and get everyone out without injury. Cityline was hired to perform emergency services at the home and following reconstruction. 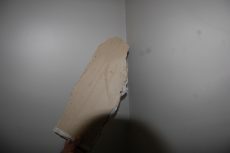 We brought in our team of experts who assessed the damage and determined the proper course of action. Because of the age of the home extra precaution had to be taken. However, because of our experience with dealing with homes of various ages we knew how to proceed forward without too much of a delay in time. Due to damage caused by the fire, water and smoke, as well as the already compromised structural integrity, the residential home was in desperate need of reconstruction. Our demolition crew arrived and started the process of cleaning out the home. We cleared out all the burnt personal property contents of the home and tried to recover what we could for the home owners. We brought all of these items out of the home so we could work on recovery and restoration of the personal property items. 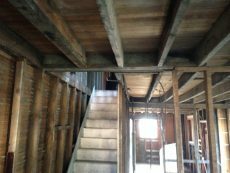 Our demolition crew came in and stripped the home down to the stud walls so we could rebuild and bring the property up to code. Cityline Construction rebuilt and slightly redesigned the home. Our electricians rewired the electrical work within the home to help prevent future fires and to better layout the wiring in the walls. While our electricians were working, our plumbing crew removed and replaced the water lines, supply lines, sewer drain lines and all necessary plumbing required to be replaced from the extensive damages caused by the fire. This also allowed the opportunity to provide a more custom livable layout. With the wiring and plumbing in place our team began to install the code required insulation so the property would pass the RES check Engergy Efficient Requirements. Pennsylvania’s current residential code is the 2009 IECC, 2009 IRC, Chapter 11, and/or PA-Alt. Adherence to Pennsylvania’s Alternative Residential Energy Provisions 2009 is an acceptable means of demonstrating compliance with the energy conservation code requirements of the Uniform Construction Code. 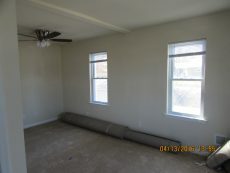 Once the insulation passed the inspection we could begin putting the new drywalls up and the new windows in. Our job was to make the home more energy efficient and structurally built. Because most of the home required total reconstruction it gave our architects a chance to rework the interior to be more intuitively laid out and to modernize the home as well, specifically with the kitchen. 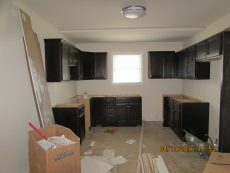 We redesigned the layout of the counters, as well as creating more cabinet space for future residents of the home. For the floor of the kitchen, specific tile was laid down to compliment the cabinets and the wall color. When remodeling the home, we replaced the carpet padding after we sealed the deck flooring for odor controls if they were not required to be replaced, the carpeting was hand selected by the homeowners to ensure color, quality and liking to the touch in all the rooms to help out with the cold winters and give the rooms a warm vibe. The lighting was also important to incorporate natural lighting while still being able to have the light fixtures in the home in effective places. The new carpet along with the new paint and lighting helped make the place feel welcoming. Overall we are very proud of the work we did with this home and we hope that any and all future homeowners or tenants enjoy what we have done to it.